Between the beautiful, colonial streets, historic fortifications, lovely beaches, and fabulous sunsets, Cartagena has no shortage of great photo ops. You will certainly be the envy of your friends and family with all the great pictures you take in Cartagena. Read on to see the top 12 must take photos in Cartagena. *Disclosure: This post contains affiliate links, which simply means if you click them and go on to make a purchase, I can receive a commission. There is no additional cost to you. To learn more please consult out Disclosure Policy. Read on for a list of 12 great photos to take while in Cartagena! Image Source: Pixabay. Cartagena has tons of colonial charm, historic sites, and sits on the beautiful Caribbean ocean. Therefore, it should be no surprise there are some wonderful photo ops. Your photos, Facebook wall, and/or Instagram feed will be the envy of your friends and full of postcard worthy shots after a visit to Cartagena. 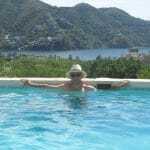 Here I will be showing you, in no particular order, the 12 pictures you have to get while in Cartagena. Not only beautiful, they are the most memorable photos of Cartagena. If you’re a social media warrior these are some of the most Instagrammable places in Cartagena. No matter whether you prefer portraits, casual shots, selfies, or just landscapes, you won’t be disappointed with these great photos to take in Cartagena. So be sure to pack (and charge!) your camera and/or phone and buckle up for this list of the 12 must take photos in Cartagena! 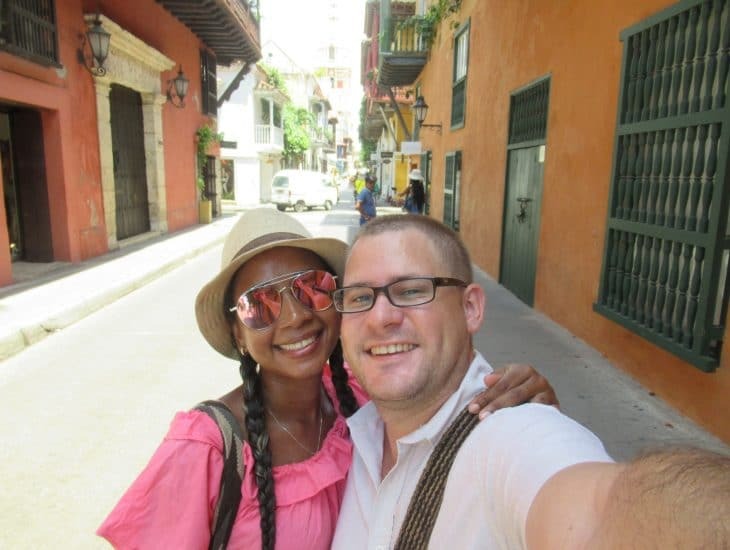 On one of the lovely colonial streets makes for one of the best selfies to take in Cartagena. Cartagena was one of Spain’s most important colonies in the Americas and a center of its wealth and power. That makes it one of the best examples of colonial Spanish architecture. With colorful hues and big, flower filled balconies, some of the streets are as picturesque as it gets. Snapping a photo on or of the street is therefore absolutely one of the best photos to take in Cartagena! The streets around the Cathedral where you can get it in the background make for especially good spots. Some of the streets in Getsemaní are also gorgeous and provide neat architecture. See also: A Primer on the History of Cartagena to learn more about the city’s history. 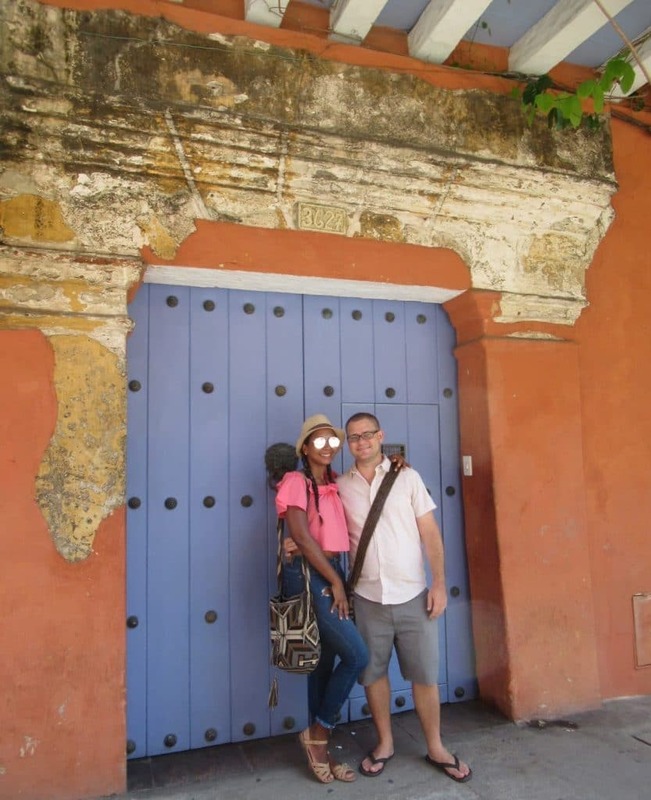 Standing in the beautiful colonial doorways are another one of the pictures you should take in Cartagena. Those streets are so pretty because of all the old colonial mansions. With Cartagena’s epic heat, they were built with high ceilings to help keep them cool. That means they have some big wooden doors. In fact, the one above is tiny compared to some of them! In addition to serving a practical purpose, they make for another one of the most memorable photos in Cartagena. A photo in the doorway might be one of the best Instagram photos in Cartagena around. You can check out this photo journal of Cartagena’s most charming doors from Sapphire & Elm if you want to scout out the doors. Look for the doors that contrast with the building’s color to get an especially pretty shot. It makes for a great solo, couple, or group photo. Bonus points if you snap your photo with one of the famous iguana door knockers! They marked the homes of the colonial high society. You can learn more about them and the other different knockers in this post from Atlas Obscura. Getting a shot under the giant Colombian flag at the Castillo San Felipe is undoubtedly one of the most Instragammable photos in Cartagena. Image Source: Wikimedia Commons. A visit to the Castillo San Felipe, the largest Spanish colonial era fortification in South America, is undoubtedly one of the must. The fort has an interesting history and massive walls. Along with a nice view of the city, it makes for one of the best places to take photos in Cartagena. With the view at the top of the fort, pretending you are firing a cannon, or in the tunnels all make for great photos. 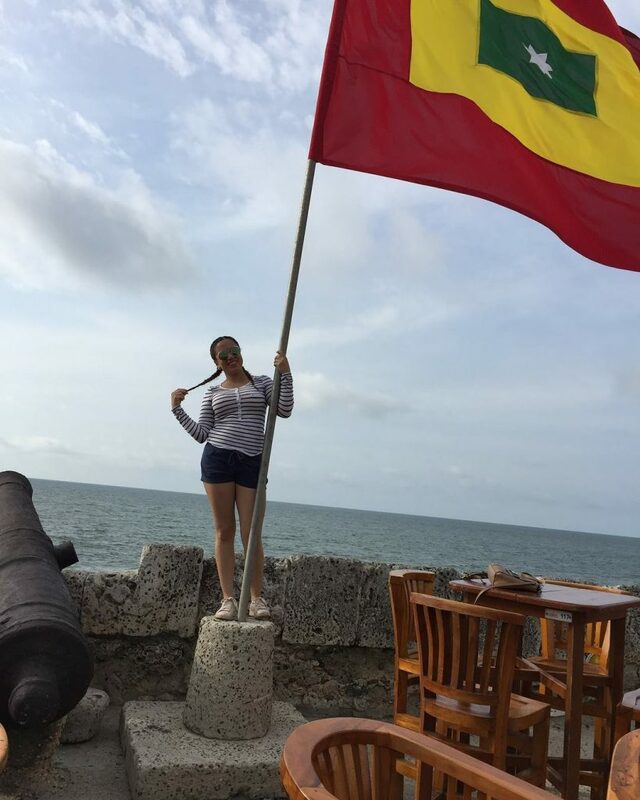 However, the one photo you have to take in Cartagena at the Castillo is with the giant Colombian flag that flies over the fort. Therefore, the fort is not only a great chance to learn about the history of the city but also get one of the most memorable photos of your visit to Colombia. You can take your photo from below to show off the massive walls or from the top to include the view. 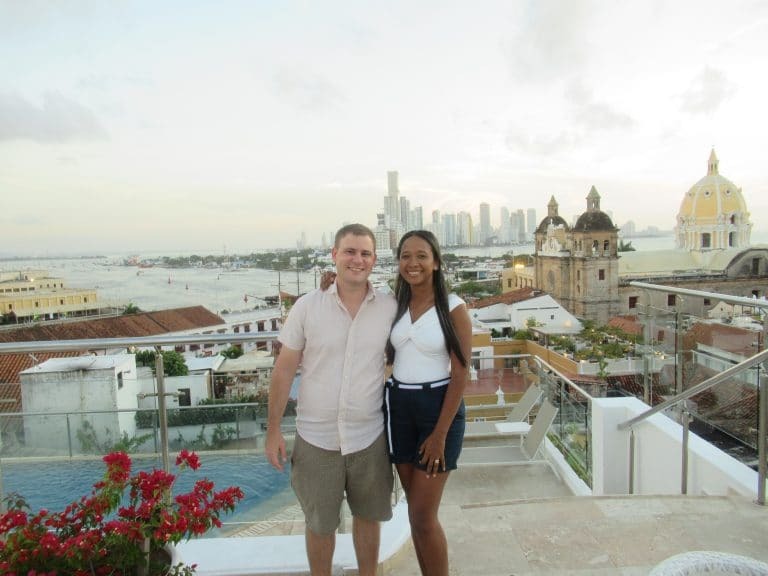 Snapping a shot with the iconic Clocktower in the background is another must have photo from Cartagena. Built into the wall in the center of Cartagena is a tall clocktower. Originally, the structure was just a tower. After the completion of the city’s wall in 1631, it served as the main gateway into the colonial walled city and was linked to Getsemaní with a drawbridge. A clock was added to the tower in 1874, and the tower was renovated in 1888. The current Swiss clock was added in 1937, giving this icon its present day look. It has become a major symbol of Cartagena and is called the Torre del Reloj or Reloj Publico. Today, the Clocktower is a major landmark (and well, it still is the gateway to and from the Centro and Getsemaní). The area is also a hustling and bustling gathering area with vendors, people meeting up, or people simply heading to and from work downtown. All the people posing to take this must have picture from Cartagena only add to the bustle! Getting a shot atop the wall, this one at Café del Mar, is even better with a cannon and flag of Cartagena! Cartagena is one of the few colonial cities that can boast that much of their wall still remains intact today. In fact, with the exception of the section along the Avenida Venezuela, you can walk almost the entire circle of the walls! A stroll along the wall is not only a must do but also one of the best cheap activities in Cartagena (it’s free!). There are numerous spots along the wall that make for a great spot for a photo. You can get the Caribbean Sea in the background from nearly all of it, and there are numerous spots where you can go for a photo with a cannon. The photo above is from Café del Mar. 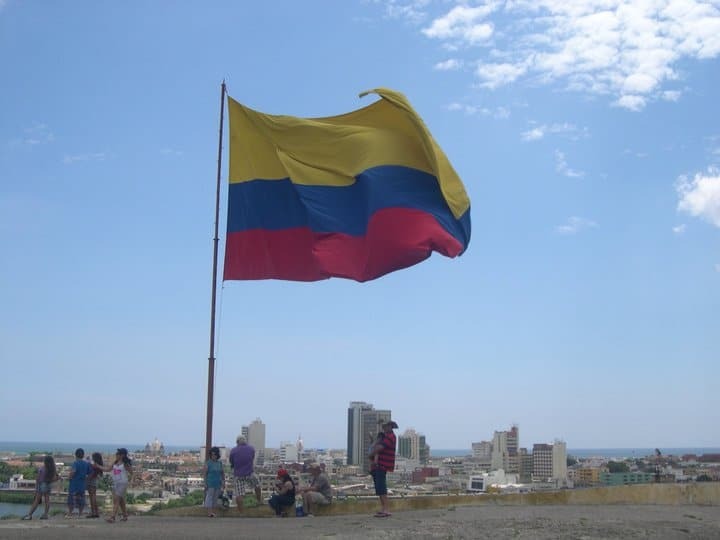 Besides offering up the chance to get a nice, cold drink after your walk along the wall, it offers some neat photos, especially with the Colombian and Cartagena flags they always have flying. See also: This post about the meaning of Cartagena’s flag. 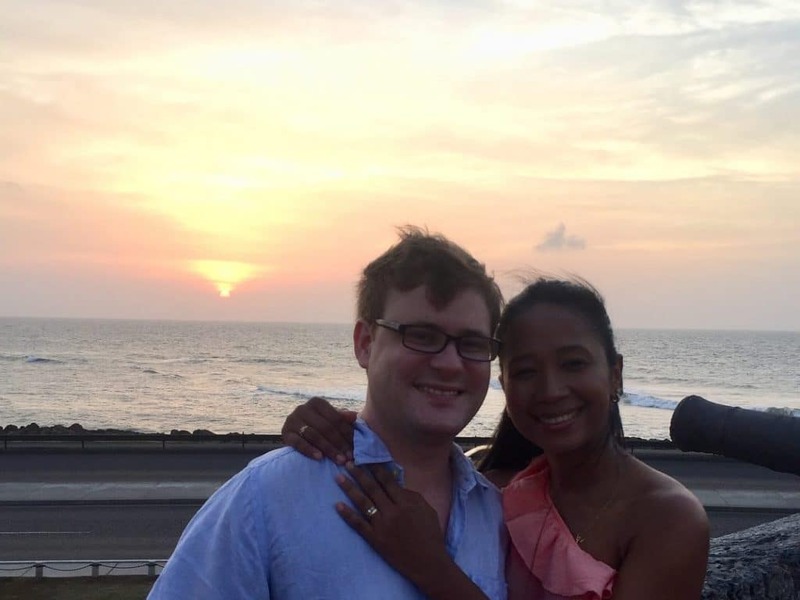 The beautiful sunsets make for another must have photo in Cartagena. I guess it shouldn’t be surprising that the sunset lands on a list of best snapshots in Cartagena, being that it is a Caribbean destination. And well, Cartagena’s sunsets don’t disappoint! There are a number of good places to see the sunset and get your photo. Just about anywhere from along the waterfront will offer a good view, particularly from the wall and in Laguito. There are also several rooftop bars and spots along the bay that will allow you to take great shots with the sunset. 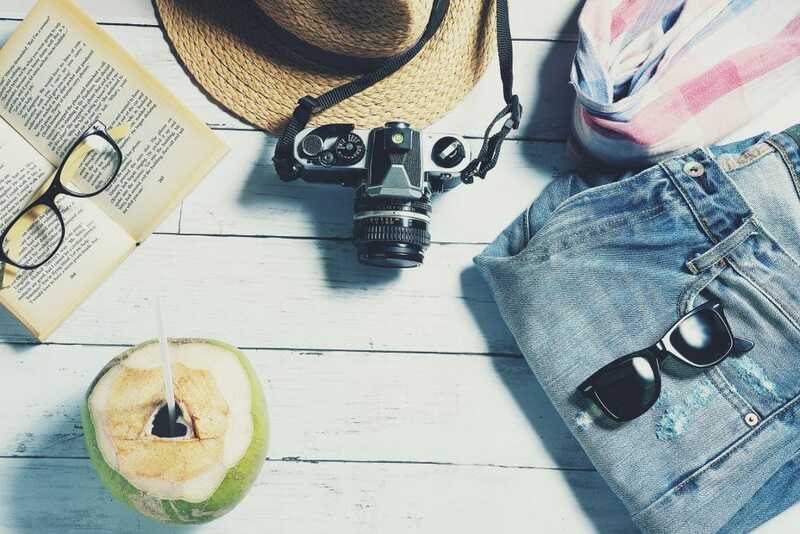 If you’re looking to not only get a memorable photo but enjoy the sunset with a nice drink, check out our recommendations for the best places for sunset drinks in Cartagena (spoiler: Café del Mar, where the two previous photos were also taken, makes the list). The view from atop Hotel Movich makes for the perfect background to our next must have picture form Cartagena. Also on the aforementioned list of best places for sunset drinks, Hotel Movich offers what I think might be the very best view in the entire city! I mean, honestly look at that photo above, it’s probably one of my favorite photos of my wife and I and the city. A view like that also makes you look helluva cool and handsome (Susana helps too). Still, all joking aside, the view from Hotel Movich really is spectacular. Put it on your Christmas cards, or heck, use it to start your own postcard company. Regardless, it’s absolutely one of the photos you have to get while in Cartagena! 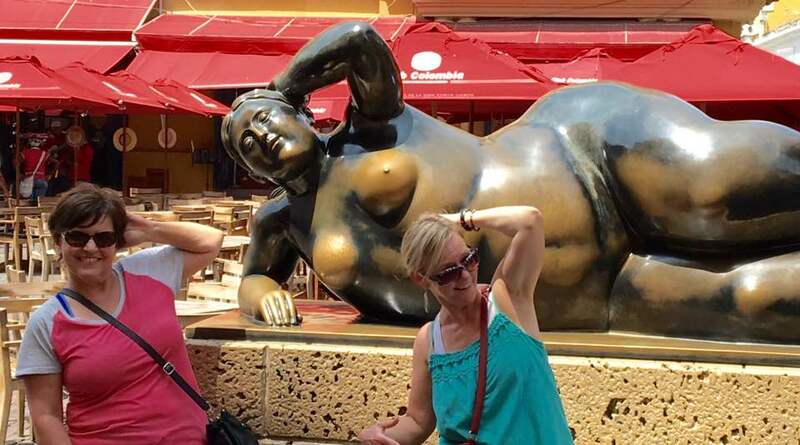 Don’t miss your chance to pose with Botero’s famous reclined lady, another one of the pictures you should take in Cartagena! Fernando Botero is perhaps Colombia’s most famous artist. He’s most well known for his distinctive style. Often times thought of as “fat,” that style is an exaggeration of figure (everything he painted and sculpted is “fat”). It is a truly unique and immediately recognizable, and well a bit weird, in a funny interesting kind of way, style. In Cartagena, his sculpture of a posing, reclining, voluptuous woman stands out as a landmark and one of the best photos to get in Cartagena. Botero donated the statue to the city in 2000 and it sits in front of the church at Plaza Santo Domingo. Be sure to strike your best pose like my mom and aunt Pam above to fit in with this famous and glamorous lady! Normally with different colored flags, here the street was decorated with Colombian colors for World Cup 2018. Gestsemaní is possibly the hippest neighborhood in all Colombia. Located just outside the walled city, it has become a popular place for travelers and revelers. There are a number of cafes, bars, and restaurants, and the Plaza de la Trinidad is a popular night time hang out spot. However, the can’t miss photo op in Cartagena in Getsemaní is with the colorful flag pennants hanging from Calle San Andres (Carrera 10). They are located on the two blocks between Calle Media Luna and Centro (across the street from Café Havana). There are a number of hostels and restaurants on the street as well. Normally with colorful flags, the photo above was taken during the 2018 World Cup. But the flags up normally are still very cool. They give the street a neat and permanent festive flair. That makes it one of the coolest photos to take in Cartagena. Nearby on Callejon Angosto (Calle 27) two blocks off of the Plaza Trinidad, there are also umbrellas draped over the street with a number of pieces of neat graffiti, making it another nearby great photo to take in Cartagena. On the beach in Marbella, a snap shot with the Cartagena sign is next on our list of the best places to take photos in Cartagena. 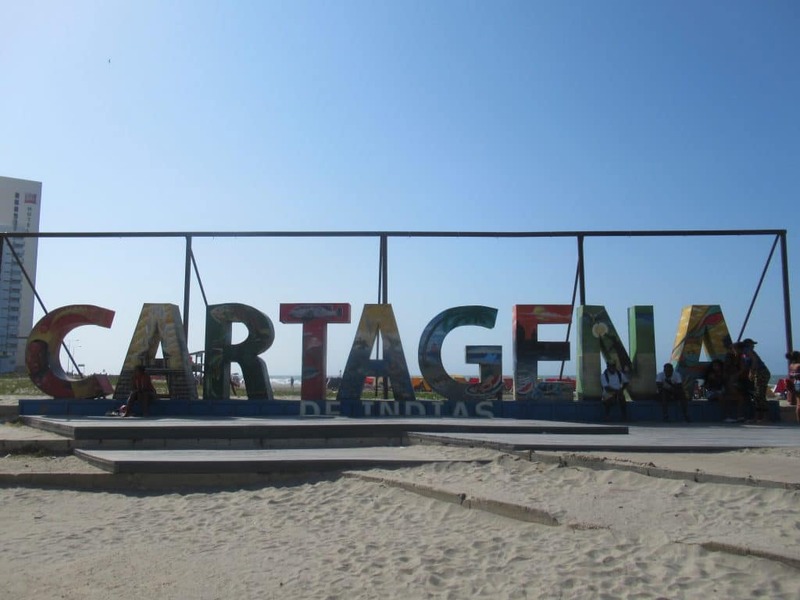 Located along the waterfront, the Cartagena sign is a relatively recent addition to the best places to take pictures in Cartagena. New or not, it still makes for one of the best photos and most Instagrammable places in Cartagena. The sign is in the neighborhood of Marbella on the Avenida Santander, approximately halfway between the airport and the walled city. Located right on the beach, it’s positioned so the sun sets almost directly behind it. That makes it an especially good combo with number 6 above! At sunset or not, it absolutely makes for one of the best photos to have from Cartagena. To get to the sign, you can get a taxi or the Transcaribe bus headed for Crespo. It is about a half hour walk from the walled city along the waterfront to the right facing the sea. A taxi should charge no more than 8,000 pesos from Centro ( approx. 10,000 from Bocagrande). I’d imagine you could negotiate easily for him to take you there and back and even be your personal photographer! See also: A Complete Guide to Getting Around Cartagena to learn how to take the Transcaribe bus and the correct taxi prices in Cartagena. The San Pedro Claver Church is one of several great photo opportunities in Cartagena with churches. 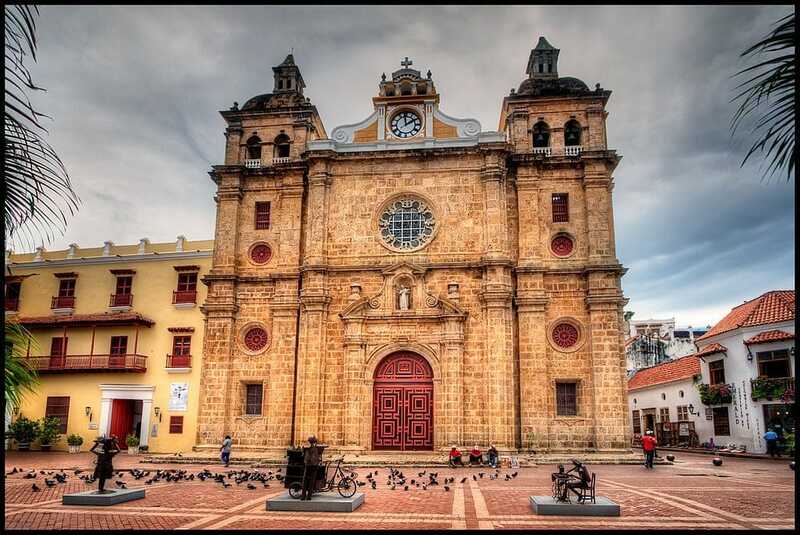 Being a major seat of Spanish colonial power and wealth, there are several gorgeous churches built in Cartagena. All of these historic churches make for a great, classic photos. My personal favorite is the San Pedro de Claver Church. San Pedro de Claver was an advocate for better treatment for slaves and is often times referred to as the saint of human rights. The church built in his honor (and whose alter also houses his tomb) is a gorgeous piece of architecture and has a pretty plaza in front of it. That makes it an awesome example of the most gorgeous photos in Cartagena. There are other churches that will give you profile picture worthy photos in Cartagena too. The Cathedral is very pretty. However, it can be hard to get a picture up close that also captures its gorgeous and colorful cupola. As noted in #1 above, capturing it in the background does it great justice. The Santo Domingo Church is also pretty and right in front of the Mujer Reclinada. There are smaller churches worth taking a picture with in Cartagena as well. These include the church just off the Plaza of San Fernandez de Madrid, the church in the Plaza de la Trinidad in Getsemaní, and the church in Parque Apolo just outside the walled city in El Cabrero. 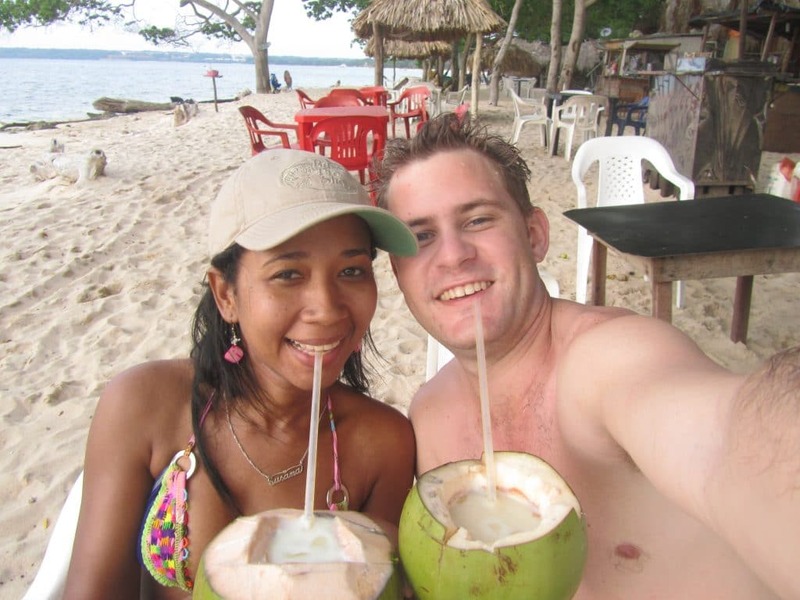 Nothing beats a coco loco or piña colada straight out of the coconut, that makes it one of the best selfies to take in Cartagena. Now that you’ve been exploring and snapping lots of impressive photos of Cartagena, it’s time to relax! In my humble opinion, there’s nothing more tasty or good for reminding me how lucky I am to be in the Caribbean than a tasty drink served in a coconut. Personally, I’m a fan of a good Piña Colada, but I’m even a bigger fan of a good Coco Loco served straight up in the coco. What is a Coco Loco (or Crazy Coconut), you ask? Well it’s basically a Piña Colada minus the pineapple (rum, cream and coconut milk). If you’re looking for a variation, you may also be able to get your Piña Colada served in the pineapple. Regardless of if you go with a Piña Colada or Coco Loco or even a nonalcoholic coconut with its milk, there’s something really fun and enchanting about having your drink out of the coconut itself. Bonus points if you crack it open and eat the meat too! Oh, and these tasty treats are best enjoyed on the beach! There you have it, the 12 must take photos in Cartagena. I hope you are able to get a shot of each of them during your visit, all with your eyes open and not red and with big wide smiles with nothing stuck in your teeth. Maybe more importantly, I hope you’ve taken them before you’ve done too much enjoying of #12! Cheers! (or should I say cheese!) and thanks for reading, I hope you enjoyed and have your camera charged! Ready to plan your photo shoot in Cartagena? 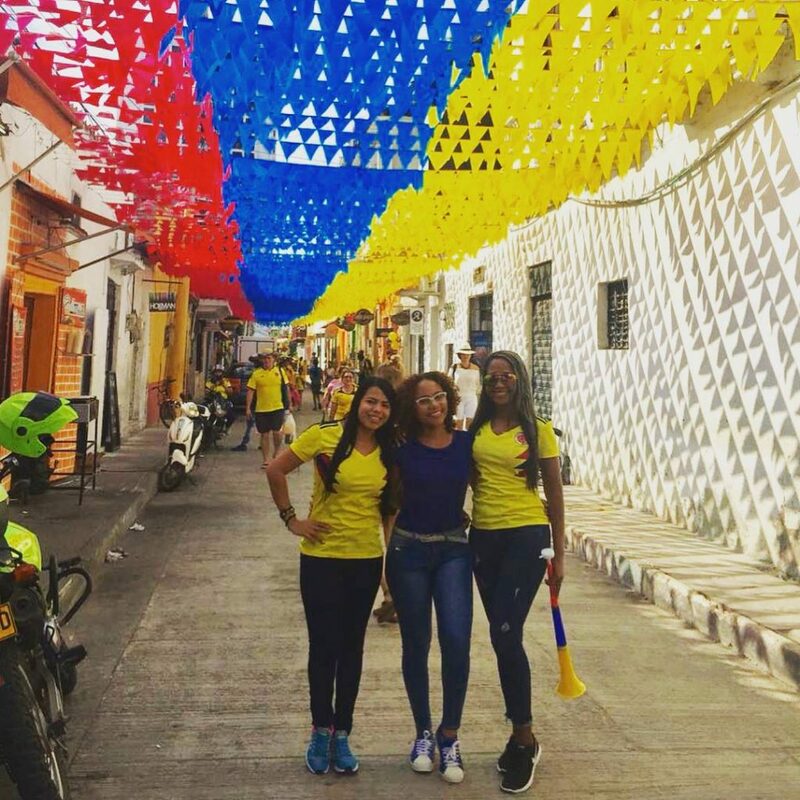 Check out Practical Wanderlust’s 10 Most Instagrammable Places in Cartagena. Be sure to check out our guide to the best areas to stay. *If you haven’t used Booking before, you can get up to $15 USD off your first reservation if you sign up here. This entry was posted in Things to Do, Visit. Bookmark the permalink. Great photo ideas!! And thanks for including our post as a suggestion, too! Hi Lia, thanks so much for the kind words! 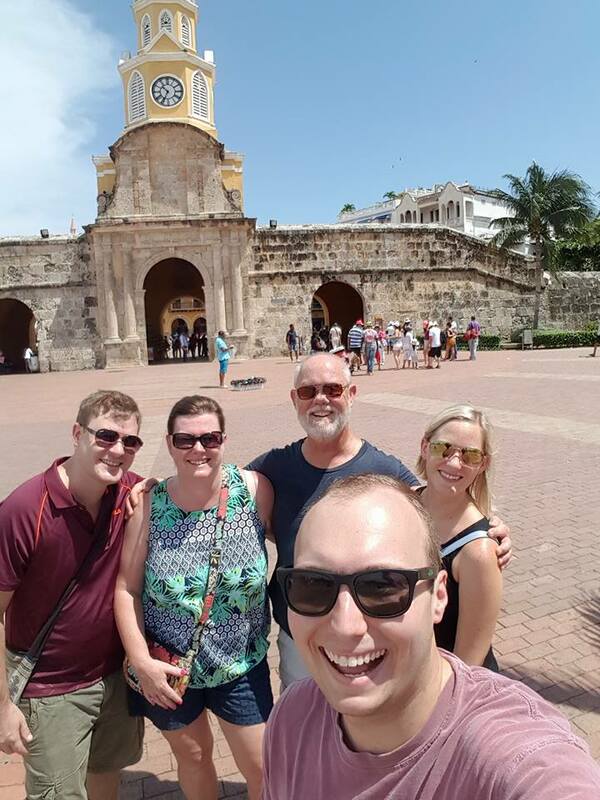 Hi, my name is Adam McConnaughhay and welcome to the Cartagena Explorer. I came to Colombia as a volunteer teacher in a town just south of Cartagena in 2011 and have stayed ever since. I started Cartagena Explorer to share my experience and love of this wonderful city and country. I hope you enjoy and get a ton of value out of all the content on the site. Learn more at our about page. Disclosure: Cartagena Explorer participates in a number of affiliate programs, including Amazon Associates, which allows me to earn commission from qualifying sales made after a click on a link. There is never any additional cost to you and is a great way to support the site! Consult the disclosure policy linked above for more information.